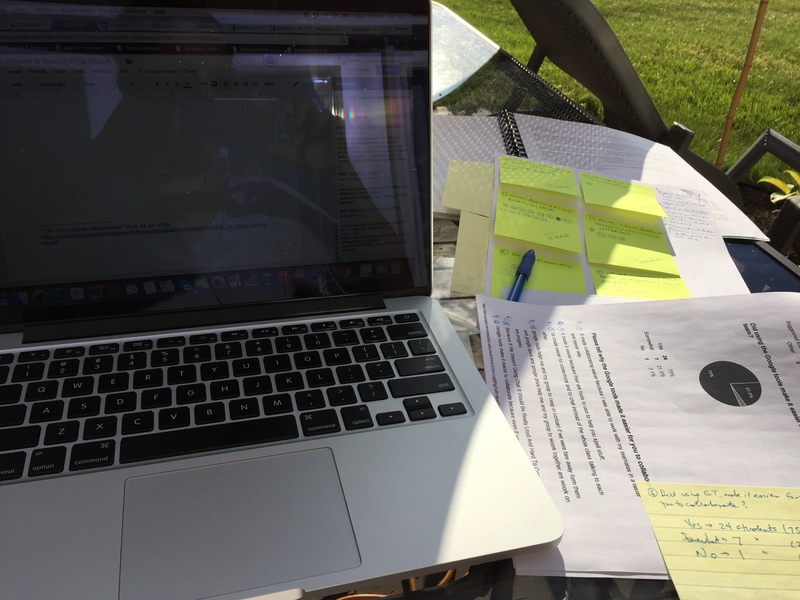 Letting go of Kurzweil and Dragon Naturally Speaking and embracing web-based Read&Write…it can be done, but not without a few (minor) hiccups, as is usually the case when implementing any new technology on a large scale. My Board purchased TextHelp‘s Read&Write Chrome extension (Premium) as a comprehensive assistive technology solution for our students this year. Since we are a Google Apps for Education school board, and the fact that R&W is a fraction of the cost of Kurzweil and Dragon (and less intrusive), it just made sense. 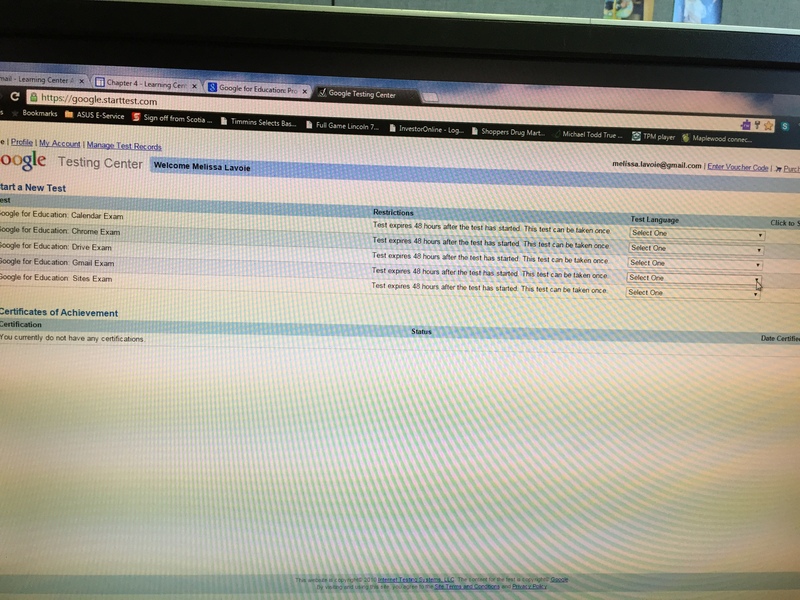 Our Google Admin pushed out the extension to all Google users in our board, and the ed tech team then needed to show these users where to find the Read&Write extension, how to allow and authenticate the extension, and provide some training as to how it works. Since R&W is basically a toolbar that appears on webpages, in Google Docs and when working with PDF and ePub files (whenever you activate it by clicking on the purple puzzle piece), it is far less conspicuous than the telltale headsets and laptops designated for one particular group of students. R&W works on any device, and is far more user-friendly than Kurzweil and most certainly Dragon (voice profiles, anyone?). The tools in each of the 3 toolbars (Docs, webpage and PDF) are useful to ALL students (and teachers!). It also promotes the important idea of taking ownership of HOW each person learns, remembers material, studies, researches and takes notes. When using the various tools, users can determine whether or not the tool is useful to them, depending on how they learn. They can pick and choose the tools they wish to use at their leisure, depending on the actual activity and if/when they need it. Of course, this time for classroom practice needs to be fostered by classroom teachers, following proper training facilitated by an educational technology team. Our school board works with Windows laptops, Chromebooks as well as some iPads. Many school boards use a variety of devices, which I think is great! But, we did run into some issues when working with Windows laptops and the fact that teachers/students were not seeing the “purple puzzle piece” in order to start the initial authentication process. Ensuring teachers and students were actually signing into their Chrome browsers, and not just their school Google accounts, needed to be addressed. Accessing Read&Write on an iPad is very different from accessing it on a Chromebook or Windows laptop. It is essentially a keyboard that you have to add under your General Settings, and the functions are certainly more limited. I would suggest simply turning on your Accessibility features under Speech (Speak Screen is great for use with webpages) and use Siri for STT and TTS (if you have iPad 3 or later). Read&Write sometimes has trouble extracting text from within images when certain materials are scanned and OCR’d (so, mostly PDF files and some webpage content). Now, Kurzweil had difficulty with this too. 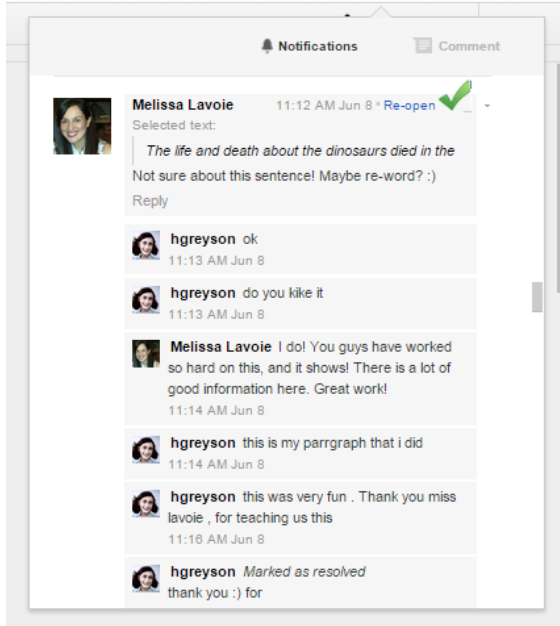 HOWEVER, there is now a new Screenshot Reader tool in the Read&Write toolbar! This tool is its own extension, so you have to install it independently from Read&Write. It is essentially a screenshot tool, and when you click on it, your cursor turns into a screenshot capture tool (like a plus sign) where you drag your cursor around the text you want it to capture, let go, and then it reads the content out loud! This is a great solution for image-heavy content. This tool also works with Google Slides and Google Drawings! I’ve tested it out with different types of graphs, as an example, and it reads the content quite well. I want to share with you a Google Slides presentation we are using for training and reference. I modified, added to and updated it from presentations by Randy Kirsh and Tammy Tkachuk, and they are both credited within the presentation. If you are a GAFE school board and looking into alternative assistive tech solutions, this could help. Feel free to contact me as well if you have any questions. The teachers in my Board acquired Chromebooks (namely CTL Education Chromebooks) at the beginning of the 2015-2016 school year, as part of a plan to move towards and embrace web-based computing and Google Apps for Education. We also have Chromebooks for our students, and these will be in their hands very soon. This is a presentation I created to address some concerns and questions teachers had at one particular school; however, the questions and content can easily be changed to suit all needs as I continue training. Many of our teachers have either never heard of Chromebooks or have not used them extensively (if at all). To be perfectly honest, I myself have not had much experience with Chromebooks either, so I’m learning right along with them! The training I provided on this day consisted of two small groups; one in the morning and another in the afternoon, where the ratio was 2:1. This was extremely helpful in addressing all of those little questions that pop up while test driving their Chromebooks, particularly regarding how they differ from the Dell laptops they have been using for years. I am sharing this presentation here, and hope to receive some feedback from other school boards – what were some of the challenges in deploying Chromebooks to your teachers and support staff? Triumphs? How about distributing them to students? I’d love to hear from you! As part of my school board’s Council of Ontario Directors of Education (CODE) funding, I was tasked with developing and executing a research project. 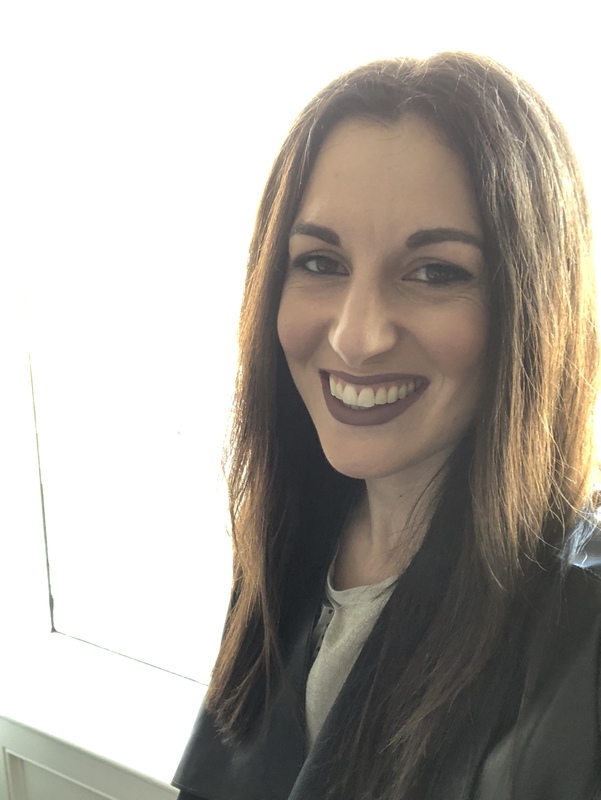 Based on this article on the ISTE website, and the work of Leigh Zeitz, an associate professor of instructional technology at the University of Northern Iowa, I worked to modify the concept presented to better reflect the needs of the grade levels I planned to start working with – namely Junior and Intermediate levels. Our project is focusing on how the use of technology, specifically the collaborative tools offered by Google Apps for Education, can increase cooperative, constructivist learning environments and enhanced student achievement and engagement. We are examining whether students’ learning about a topic is transformed, using the tech tools provided in the classroom and by collaborating with peers/the teacher (working cooperatively) to further develop thinking skills. In my first course at the University of British Columbia’s Master of Educational Technology, I worked with two students to develop a platform for virtual field trips (VFT) for teachers and their students. 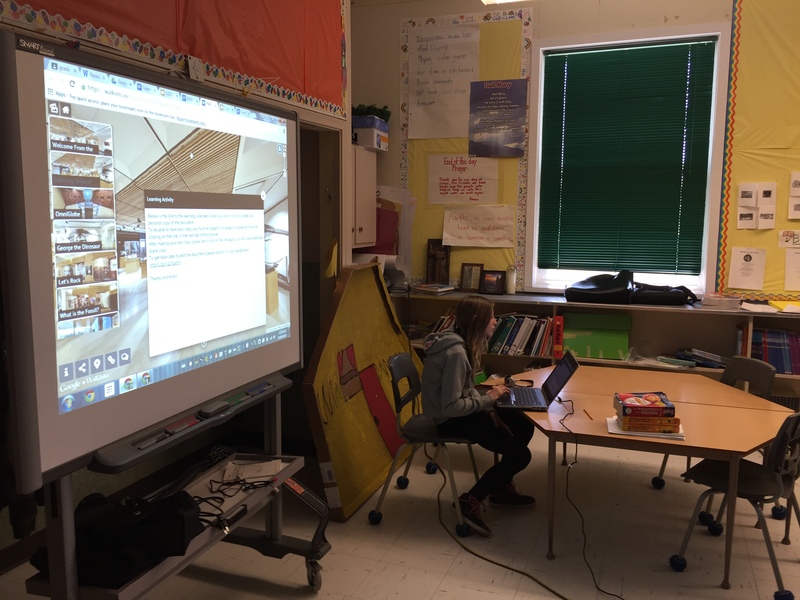 We used Google Business View (GBV) and an application called WalkInto that allowed us to embed educational materials as overlays to enhance the virtual field trip. Our project posited that GBV can be used as a tool for creating interactive, audience-responsive, virtual field trips for students. GBV is an online application, part of the Google Maps suite. It allows certified users to create 360’, interactive views of the interior of Google Map’s location. For our project, we created an interactive tour of UBC’s Pacific Museum of Earth. We used UBC’s wiki spaces to build a teacher’s guide on the use of our virtual field trip for educators, which includes suggested activities, curriculum expectations and how to use the VFT. 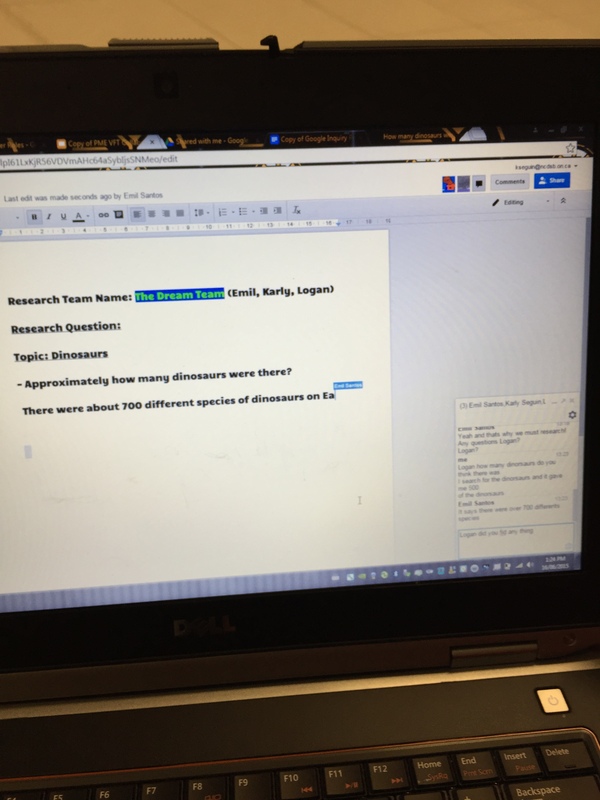 I wanted to combine the elements of a VFT and the collaborative affordabilities of Google Apps for Education, in order to build a unique, engaging and cooperative learning experience for students while gathering data for my board’s CODE research project. 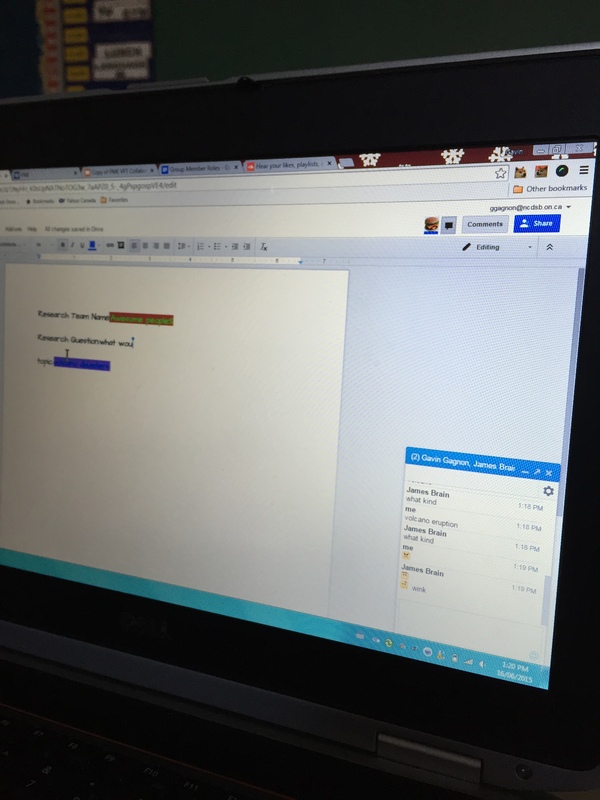 So, the NECDSB Google Collaborative Inquiry Project was born. The target group of the project research for this phase is Grades 5 and 6. One Grade 5/6 class in Cobalt, Ontario and one Grade 6 class from Timmins, Ontario were highlighted for the purposes of this research. 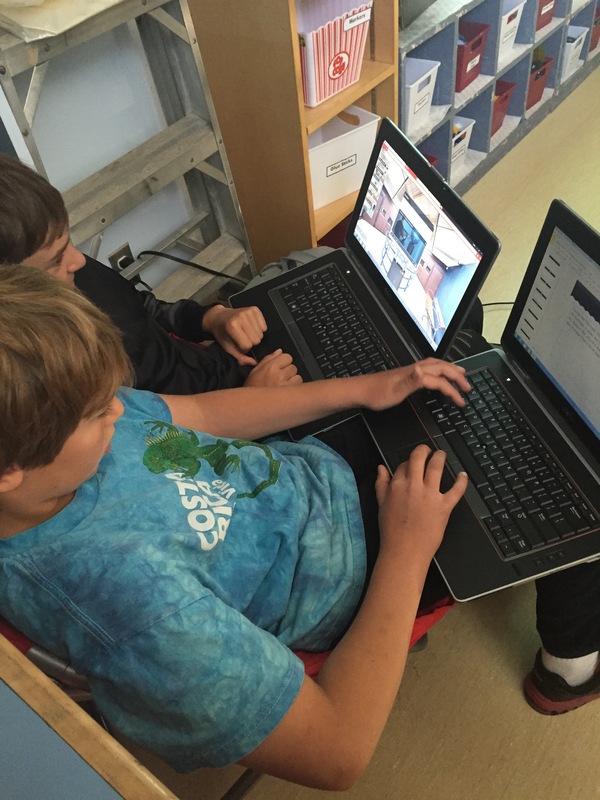 The subject areas we focused on were Literacy (Writing) and Science (Scientific Inquiry / Research Skill Continuum); with a particular emphasis on collaborative inquiry and group work performed entirely online using Google tools. Measuring student engagement is a tricky endeavour. While there does not appear to be a single definition for engagement, the following definition represents an aggregation of the literature: Engagement is seen to comprise active and collaborative learning, participation in challenging academic activities, formative communication with academic staff, involvement in enriching educational experiences, and feeling legitimated and supported by university learning communities (Coates, 2007). This definition suggests that engagement is the amalgamation of a number of distinct elements including active learning, collaborative learning, participation, communication among teachers and students and students feeling legitimated and supported (Beer, Colin, Ken Clark, and David Jones. “Indicators of engagement.” Proceedings ascilite Sydney (2010). The students were given the choice of tool they used throughout the process. In our post-survey results, the majority of students used the chat tool (30 out of 32 students at 93.8% of respondents). This is not surprising. According to the Media Smarts report “Young Canadians in a Wired World, Phase III: Life Online”, which is a report based on the findings of a survey administered in 2013 to 5,436 Canadian students in grades 4 through 11, “online life has become increasingly social, with social networking now an integral component of many online activities. Online media are primarily used for entertainment and communicating with friends and family, and one of the most frequent online activities reported by students are: reading or posting on someone else’s social network site, at 41% of respondents (“Life Online Report – MediaSmarts.” 2014. 24 Jun. 2015 <http://mediasmarts.ca/sites/mediasmarts/files/pdfs/publication report/full/YCWWIII_Life_Online_FullReport.pdf&gt;). As educators, we should heed these findings, and listen to our students who tell us (and show us) that they like to use social media. Also as educators, we should realize that just because students use social networking sites for chatting with friends, does not necessarily mean that they are using these sites to their fullest potential. Participatory civic uses of digital media are also relatively low. This is an area we can (and should) tap into in order to harness student engagement and move forward towards a participatory civic culture that fosters active and collaborative learning. Students in this project were given the opportunity to engage in this type of learning environment. During the activity, the students frequently demonstrated that they were engaged with the project. Three qualifiers were used to gather anecdotal evidence: Interest, Time on Task, and Enjoyment in Learning. 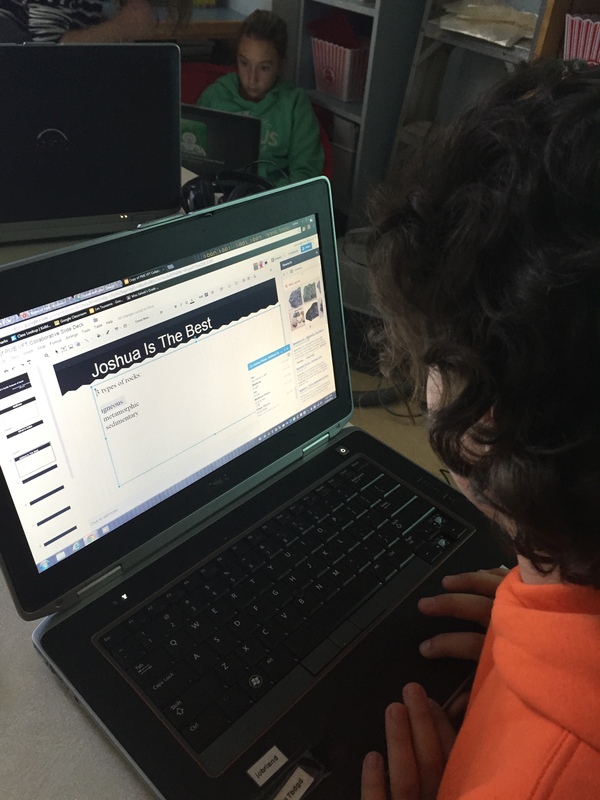 The project was a success in that the students responded favourably to both the VFT and the use of a Google apps platform to collaborate in groups online. Both were a familiar and engaging forum to them, and their enthusiasm was indicated in their post-survey responses, and demonstrated throughout the time we spent together. It is my belief that the students who participated in this research project gained significant insight into a new way of collaborating in group work situations, and a new way to research various topics. 87.5% of the students felt that the platform provided to them (Research Team roles combined with Google tools to support and enhance) helped them to learn the material better. 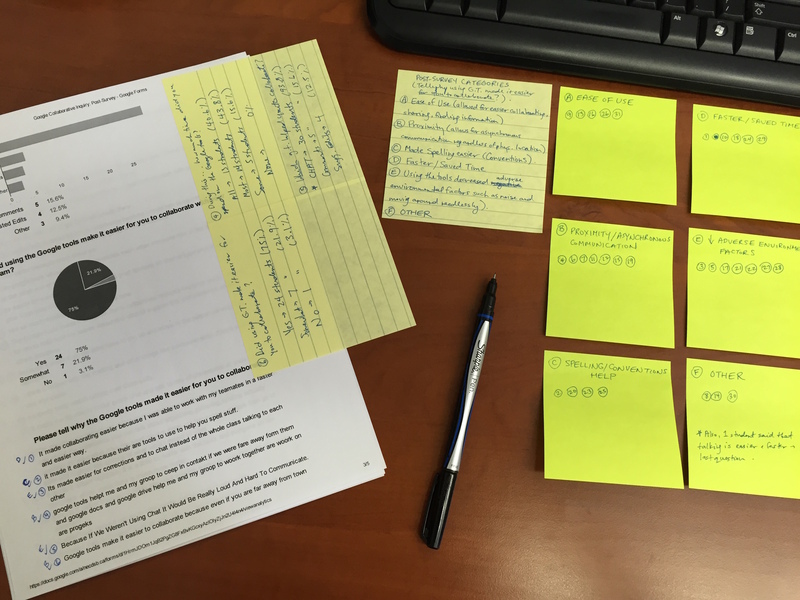 The survey results, as well as anecdotal notes taken during the activity, show an impact on student learning, and certainly on student engagement. The results hold promise for future collaborative learning opportunities in the classroom, and also indicate that further research is required across multiple grades and subject areas. Stay tuned for the next phase of research in Fall 2015! Please contact me if you would like any further information about this project, and the next phase of research. I welcome any ideas for improvement and the potential for collaboration. If you’re like me, I push my Chrome browser to its limits with the amount of tabs I have open when I embark on my daily information highway roadies. 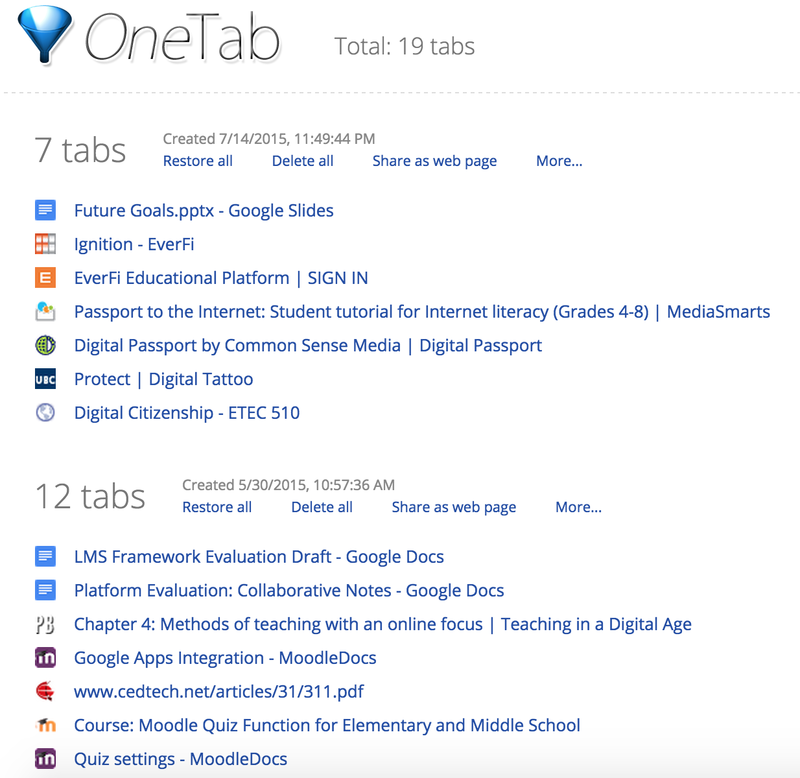 I use a free Chrome extension called One Tab. If you’re a Firefox user, here’s the Mozilla Add-On One Tab as well. One Tab looks like a funnel when it’s added to your Chrome browser, and it works that way too – when you click on the icon, it funnels all of your open tabs into one web page that you can share a few different ways. You can copy and paste the URL into an email, or as a link in your chosen LMS (Learning Management System such as d2L, Moodle or Blackboard Connect to name but a few) for your classroom. You can also “Share as Web Page”, and when you click on this option, it will create a web page for you. 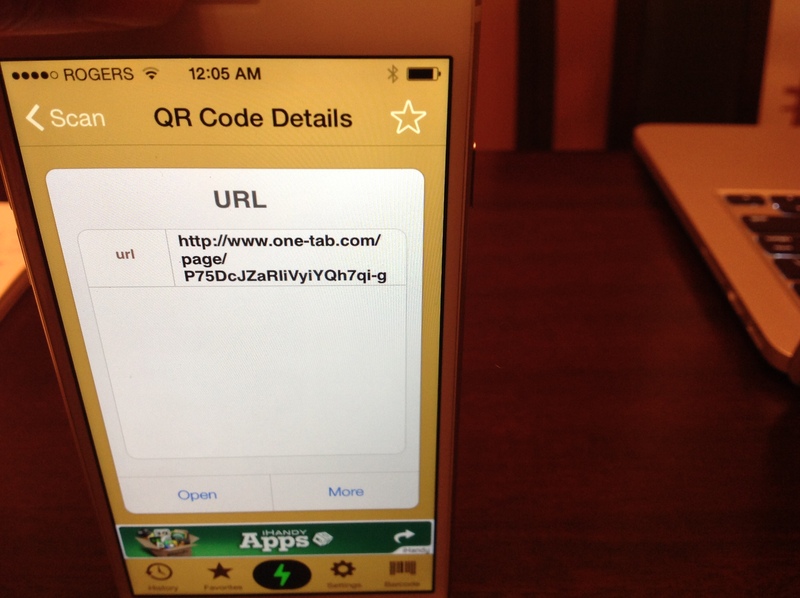 The web page includes all of the tabs you had open in a list of individual links (you can restore your tabs individually or all at once), and also provides you with a QR code that you can easily scan with a QR Reader, as illustrated here. It essentially looks like the Desktop version of the web page, but is optimized for mobile browsers. You can then click on any of the links and it will bring you to the web page. If you are signed in to your Google account while in Chrome, One Tab keeps track of each time you use it. As you can see, it will break your sessions down into timestamped subsets, so that you can go back to previous sessions if desired. When you use One Tab, you are saving up to 95% of your computer’s memory. As an example that is highlighted on the One Tab website, if you have 20 tabs open, you could be using around 2000 MB of memory, whereas with One Tab, you can gather everything into one tab and maybe use 100 MB of memory. In the classroom, a teacher might have several different web pages for students to navigate to, but is unsure as to how to share them efficiently. Enter One Tab. The teacher can share the URL via email or post on a class website or LMS, or as part of a Google Doc to help with student research. And if you want a bit of novelty for the students, they can be shared via QR code. Students can also use One Tab to share a list of their favourite websites with their peers or on their blog if they have one, or use it as a gathering page of References for a research project, as an alternative to “starring” (bookmarking) the pages. One Tab could also be used as a curation tool for students. 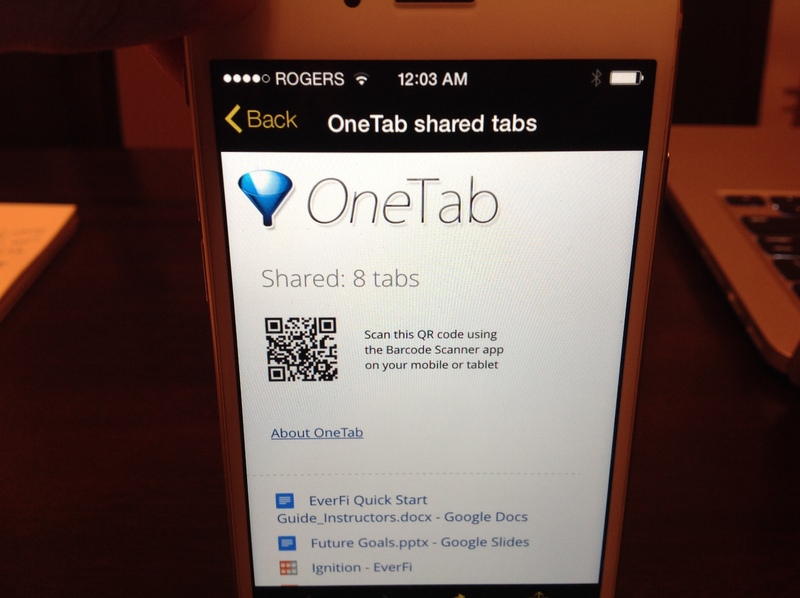 I have personally used One Tab to help me with the Google Certification exams. As I was taking an exam, I would open up as many tabs as I could without slowing my computer down too much, and keep track of what web pages I visited throughout the exam. This would later be kept as a record of where I looked for answers, and because One Tab keeps track of my sessions, I can go back to see my history and jog my memory in terms of what types of questions were asked. How would you use One Tab? The Google Educator exams will be unavailable for purchase from April 8 through June 28 while the Google for Education certification programs are undergoing a small update to better serve our users. Please note that this does NOT affect exams that have already been purchased. Anyone who has purchased exams is still able to achieve their certification after successfully passing the 4 required exams and 1 elective within 90 days. If you have any more questions, please contact gfe-certifications@google.com. Since I (and my work partner) purchased the exams prior to April 8th, we will still receive the “old” Google Certified Educator certification. PLUS, and this is a big one, we’ll get 180 days to complete our exams, rather than the standard 90 days, to compensate for the exams being out of circulation from April 8 – June 28. This occurs if you started your exams prior to June 28th, which we did – on June 25th. So, if all goes well, my partner and I will be Google Certified Educators (old school style) by Christmas 2015. Thank you for your inquiry. The shopping cart is closed until June 28th. You will have to wait until this time to purchase the needed exams. If you begin your exams between April 1st and June 28th, you will have 180 days to complete the full set (extended from 90 days to account for the time the exams are unavailable). So, if you already have the exams on your account, you will be able to take them and complete them and become certified as there is no reason to wait to complete them. In regards to test access. Once you access/start a test it must be completed within 48 hours. Please let me know if I can be of further assistance. The above quote was an email I received from Client Support at Google in response to my question about 90 days versus 180 days to complete my exams. This brings me to the main content and intention of this post! We wanted to start our Google certification big, and one way to do that is to start with Gmail. Gmail is notoriously the “hardest” exam of all. I think this is because most people typically use Gmail as their email provider, so they assume it will be easy. Trust me when I say it’s not that simple. While my partner and I passed our exams, it is because we helped each other out and took them one after the other all in one morning, so that we remained in the “zone”. This is the strategy I recommend most to everyone out there – work with a partner or group of people. Help each other out. It’s the Google way. Collaborate on answers. This was immensely helpful. It’s not an exact science, but it worked for both of us on the first try! We studied the Advanced Lessons in Gmail beforehand (see link above in bullet point 2), but we have also played around with many of Gmail’s features that the typical user may not use on a daily basis. Part of our jobs is to troubleshoot and help educators with Google apps, so we are already in this mindset. 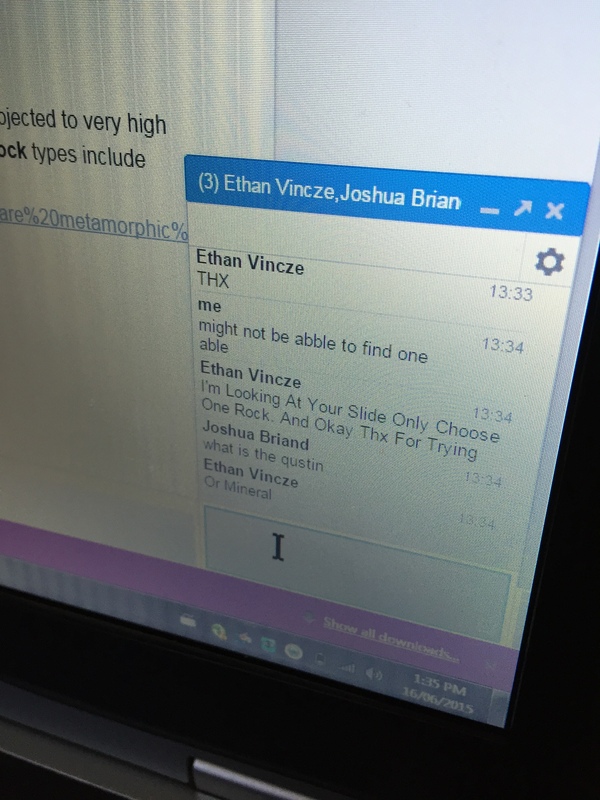 During the exam, we also had both our personal and Google Apps for Education Gmail pages open so that we could test out different scenarios/questions to prove our answers right, and this proved to be very helpful as well. I’d recommend that you do this too, if you can spare the monitor space! You can also do split screen, although some may find that too crowded. It’s really a personal preference. What do you see when you start your Google exam? It will indicate the exams you have chosen, and remind you that you have 48 hours from the point where you open/start your exam in order to complete your exam. 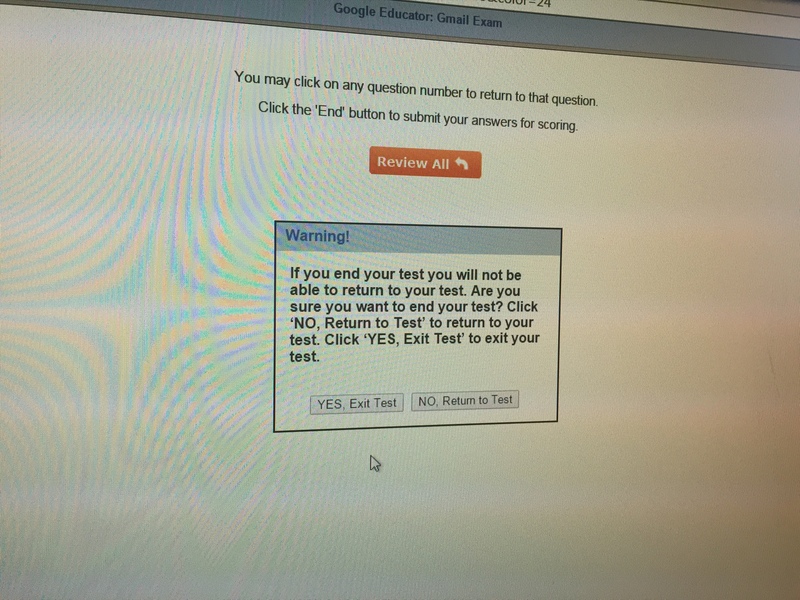 This is the screen you see prior to starting your exam – read the instructions carefully and take deep, calming breaths! 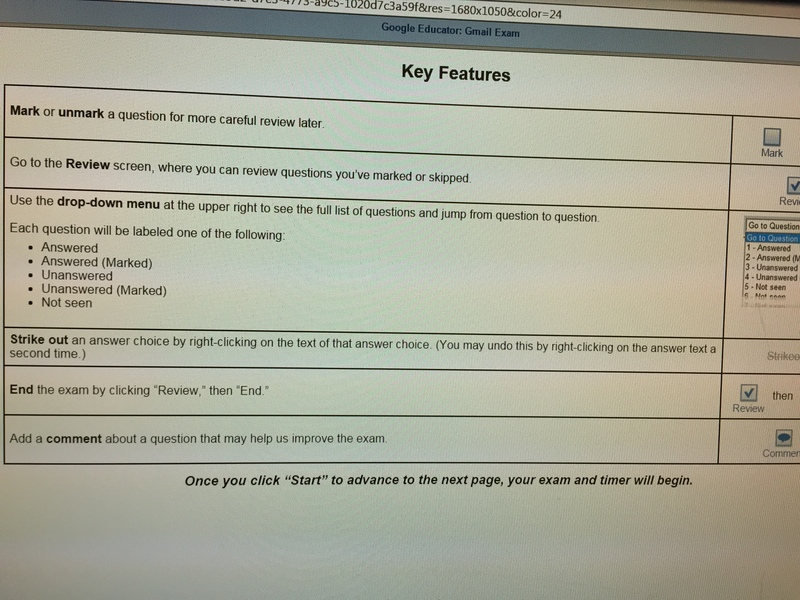 This “Key Features” screen informs you that you can go back and review questions by “marking” them (clicking on the box at the bottom RH corner so that a checkmark appears). 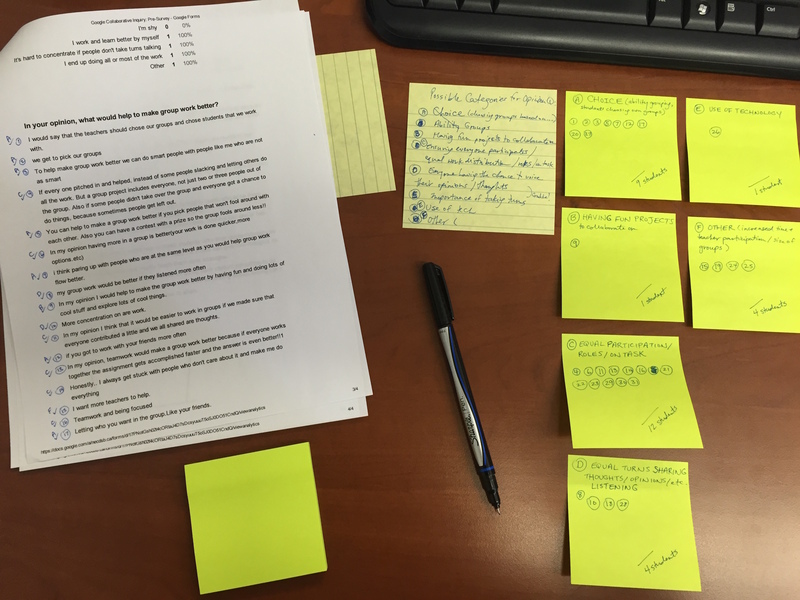 It keeps track of the questions you have marked to Review, and then you can go back without stressing out about which ones you weren’t sure about in order to look into those questions further. As well, there is an option where you can “strike-through” the incorrect choices in the multiple choice questions. This is a great visual. While the questions will differ from exam to exam, I found that there were a lot of questions geared toward Advanced Search options in Gmail, mobile applications, labels and some scenario and Admin-type questions. This could, of course, differ from the content of your exam, but this was my experience. We found that we had enough time after the exam to review all of our questions, and I even went through each and every screen and took a picture of each question with my iPhone. When you submit your exam, it will only tell you if you Pass or Fail, along with your percentage (must be 80 or better) – it will not indicate which questions you had incorrectly answered. Should you fail an exam, you will have to re-take the exam and pay the fee again. You must wait 7 days before re-taking the exam. If you purchase your exams after June 28, 2015, you will be dealing with Google’s new EDU Training Center. The way the exams are set up are a bit different from the previous certification. 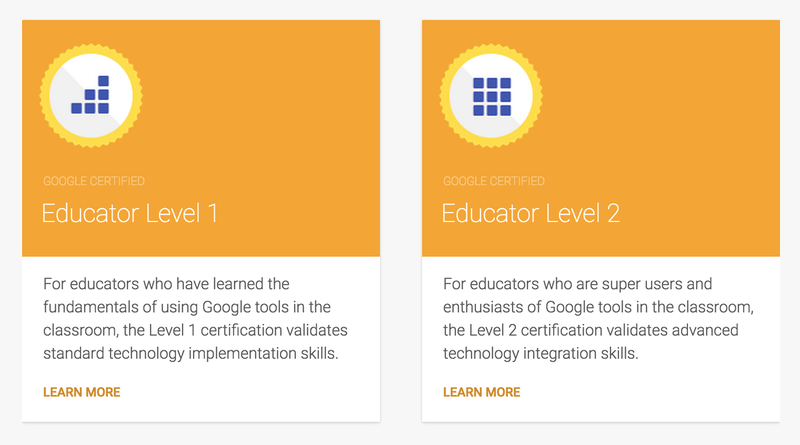 Before June 28th, Google’s Certification EDU exams had 3 options: Google Certified Educator (this is the path I am on currently), Google Certified Trainer, and Google Certified Teacher. Now, there are 2 levels of Google Certified Educator (Level 1 is your Fundamental level, whereas Level 2 is your Advanced level – similar to the Basic and Advanced levels in the previous Google Certified Educator exams). The Level 1 exam costs $10 USD, and Level 2 costs $25 USD. The other certifications are: Google Certified Trainer and Google Certified Innovator. When you visit the Google for Education Training Center, you can Sign In to your Google account, so that you can track your progress while you are studying for your certification. Once you are signed in, you will see the word “Progress” along your LH-sidebar, and beside each Unit you will see the number of minutes and lessons you are to complete, along with a progress bar underneath. This is a new feature as well, and one that will definitely come in handy during the next round of exams. When you pass all of your exams, your certification is good for 18 months. To keep your knowledge fresh, you are required to re-take your Google Certified Educator exams every 18 months. What were your experiences taking the Google EDU exams? What strategies worked for you? 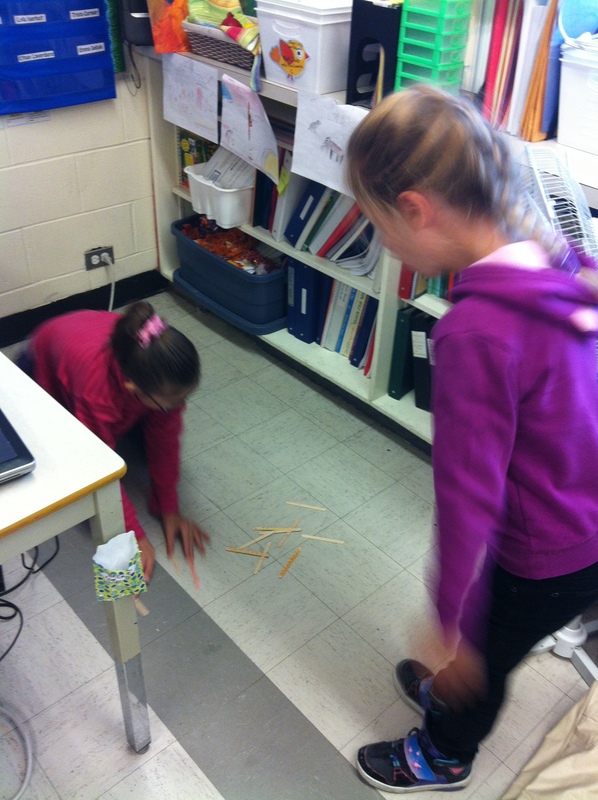 My students learned how to play two different Aboriginal math games (more can be found here). They had fun playing Throw Sticks and Stick Dice, games originating with the Apaches in the Southwest United States and the Pomo Indians of California, respectively. During large celebrations that would last about four days, nations would get together and would feast, dance and play games. Many of these games involved gambling and setting large wagers against neighbouring tribes. The kids didn’t want to stop playing the game, which is interesting, because all the materials you need to play this game can be found in nature, and not on an iPad! 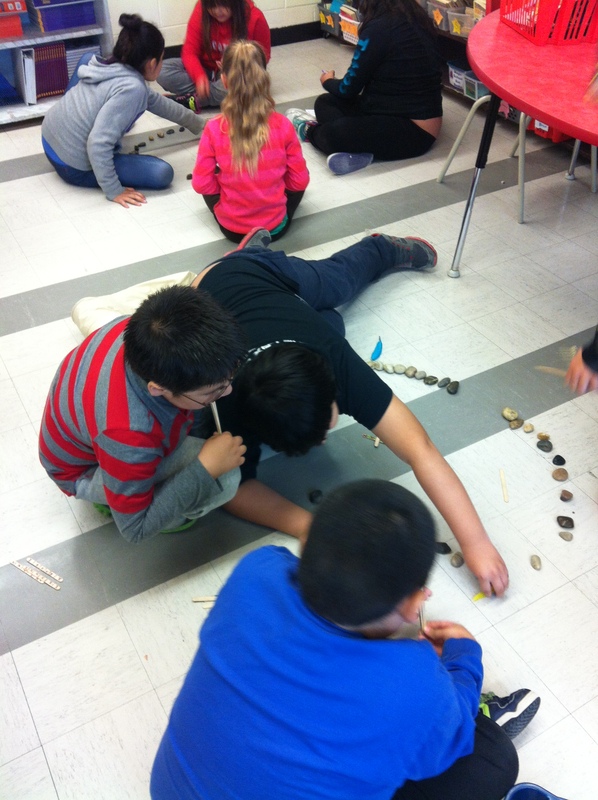 For Throw Sticks, you need: 40 rocks, arranged in 4 groups of 10 in a circle, 2 feathers for place markers, and 3 sticks (we used popsicle sticks) that must be decorated using the same patterns and colours on each. For Stick Dice, you need: 6 (popsicle) sticks, all decorated the same on one side only. Obviously there weren’t any Mr. Sketch markers back when this game originated, but I imagine that they would have burned etchings into the sticks to create patterns, and/or used things like berries for dyes. 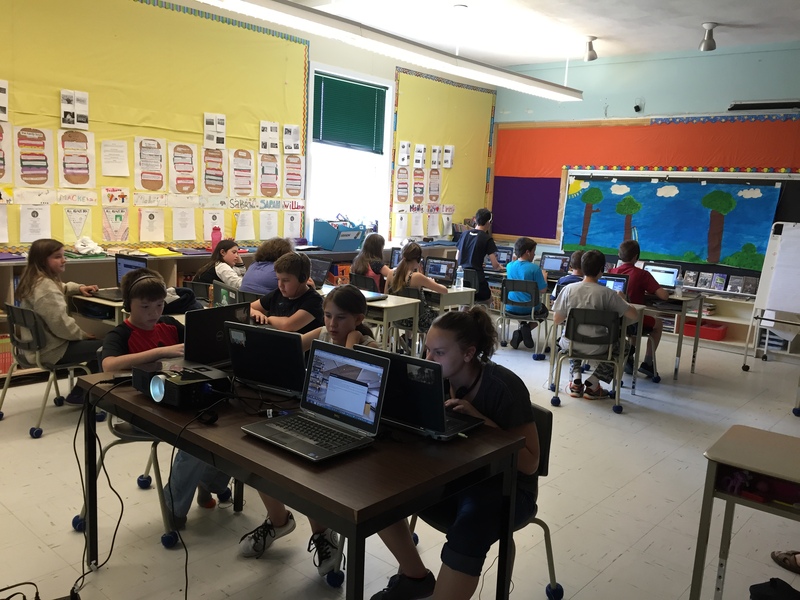 The students were then taught how to use Google Slides. 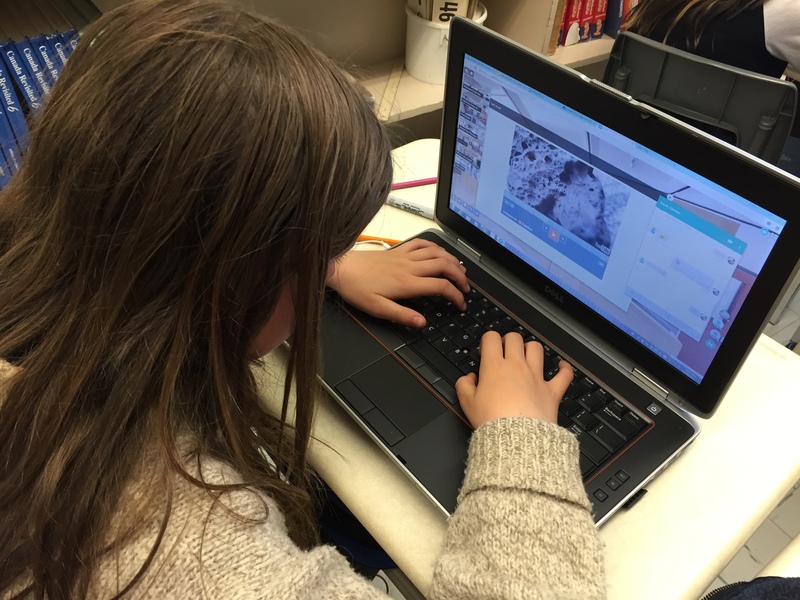 They especially loved the transitions effects and how you can “drag and drop” pictures using Google Chrome, as opposed to Internet Explorer where you have to save your image and then upload it. As part of our procedural writing unit, their task was to create a presentation all about how to play the game of their choice. When these are complete, they will be teaching another class how to play their games by showing their presentations on iPads. And because you should end your procedural text on a positive note, I’ll apply that here: Amazing work, Grade 4/5’s!